Mix ground almonds with part of the confectioner’s sugar and put in a blender. Grind the mixture once again and then sift into a bowl. Add the food coloring paste (it is best not to use liquid as this will affect the consistency of the dough). Beat part of the egg white until stiff peaks form. Put part of the water and sugar in a pot, then bring to a boil (without stirring). The temperature of the sugar syrup should not be exceed 115°C/240°F. As soon as the temperature has risen to 105°C/220°F, stir hard. As soon as sugar syrup reaches 115°C/240°F, remove from the heat and pour slowly into the foamy egg white while stirring! Continue stirring for approx. 10 min. to allow the meringue to cool slightly. Combine almond mixture and the remaining egg white until smooth. Carefully fold one third of the meringue into the almond paste to create a smooth mass. Do not stir too long! Now fold in the remaining two-thirds of the meringue. Fill mixture in a piping bag with a round, wide decorating tip. Cover a baking sheet with parchment paper. Pipe mixture in walnut-sized circles onto the baking sheet (with sufficient space in between), or use a special macaron baking mat made of silicone. Lightly tap the baking sheet on a work surface, allowing any air bubbles in the macarons to escape. Rest macarons at room temperature for approx. 45 min. Preheat oven to 150°C/300°F. Bake macarons for approx. 14 min. Remove from the oven and gently pull the parchment paper onto a moistened work surface (this step is not necessary if using a silicone baking mat). Allow macaron halves to cool, then use a damp knife to loosen them from the silicone mat or parchment paper. To make the butter caramel, heat the remaining confectioner's sugar together with the remaining water in a pot at medium temperature (without stirring) until it is a nice caramel color. Then add the cream carefully and stir gently. (Attention, it foams up and is very hot! Best use a long wooden spoon.) Make sure that no lumps form. The caramel can also form bubbles and burn easily. Once a homogeneous mass has formed, check temperature with a sugar thermometer and remove from heat at 108°C/225°F. Now add the chopped, salted butter and stir until thick and smooth. Transfer the caramel to a suitable container and refrigerate for at least 1.5 hrs. until set. Fill butter caramel into a piping bag with a wide, round decorating tip. 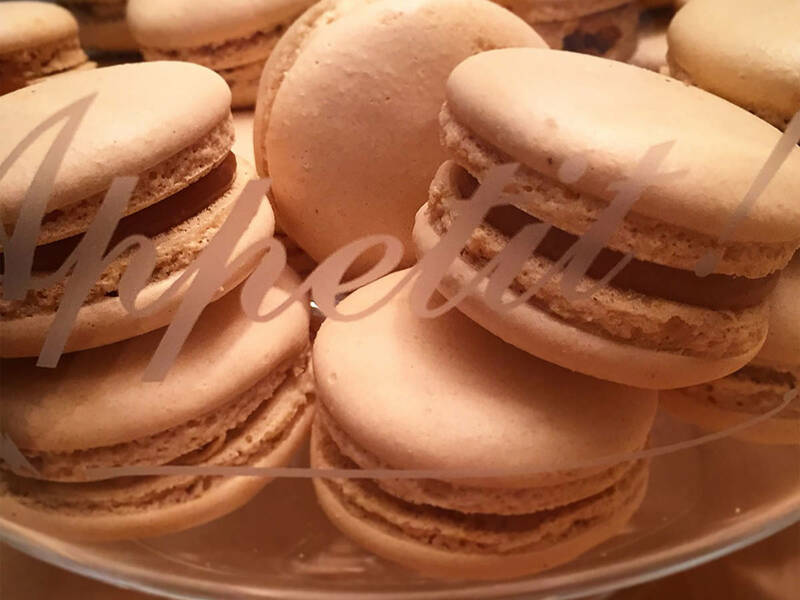 Squeeze a dollop of caramel onto a macaron, then gently press another macaron half on top. Cool or enjoy immediately.